When it comes to an established franchise, I find it hard to experience it in any other way than completely engrossing myself. Whether it’s soaking up each entry in a role-playing series, or binge-watching a movie franchise, I like to get the whole story from start to finish. 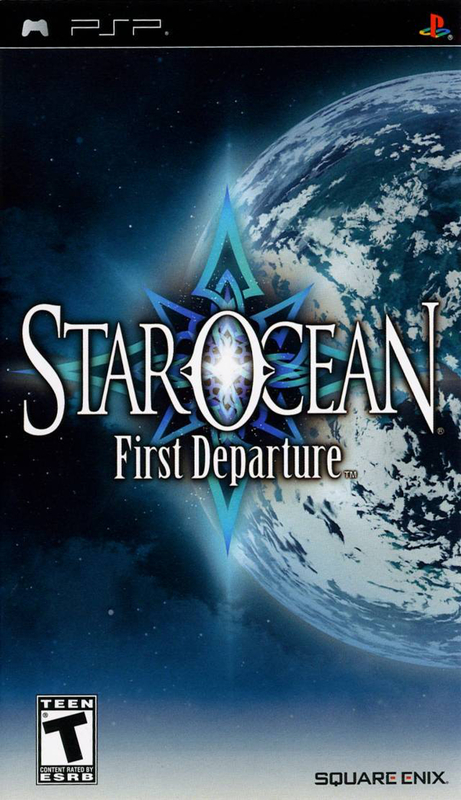 So with the recent announcement of the fifth Star Ocean game, subtitled Integrity and Faithlessness, I’ve found myself visiting the series for the first time, and from the beginning. There’ve been plenty of opportunities for me to check the series out over the years, and I’ve owned entries for years without touching them. But, much like the dual announcements of new Guitar Hero and Rock Band releases reinvigorating my desire to play earlier entries in those series’, this one did it to the nth degree. 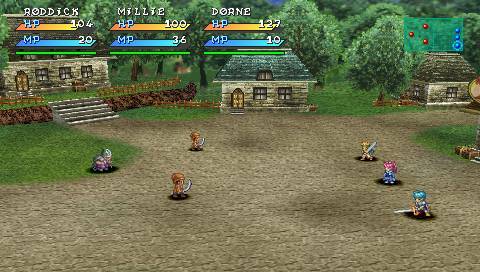 Battles took place in fully roamable arenas – an evolution of Tales of Phantasia. My first consciousness of the Star Ocean series occurred around the release of Tales of Symphonia. That seminal JRPG was one of the few on the GameCube and one of my favorites bar none. I turned to GameFAQs throughout that playthrough and the author of one FAQ in particular suggested Star Ocean: Till the End of Time so heartily, that I still remember that fact to this day. Needless to say I never checked it out (excluding a multiplayer match or two for the inaugural Game-a-Thon). Flash forward and I now own all but the most recent entry: The Last Hope. So, what better place to start than the first game? Or truly, a remake of the first game as the western release lagged behind its Japanese debut. Star Ocean was originally released on July 19, 1996 for the Super Famicom. It didn’t make it to Western shores until the PlayStation Portable remake; First Departure was released in North America on October 21, 2008. Developed by tri-Ace, the game was the product of the studio’s collective experience making Tales of Phantasia and their love of Star Trek. It’s an action-RPG whose core elements stay true to likes of Dragon Quest and Final Fantasy, but the battle system is quasi-real-time and the setting has more in common with Phantasy Star. 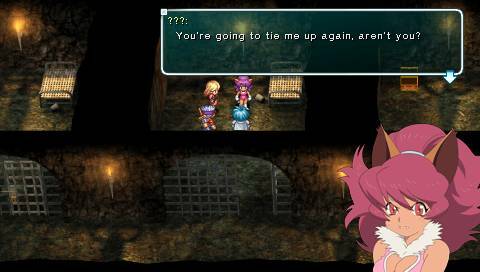 The PSP remake appears to remain very true to the original, and with the exception of a few items, I could imagine this game being a direct port. There was an omnipresent feeling of the future, even while on Roak. One of the elements that excited me the most in thinking about this series was the sci-fi setting. The ability for a lengthy RPG to fill out a world with backstory, characters, and places is a hallmark of the genre, and when that ability is buoyed by a sci-fi motif, well, let’s just say I’ve always been more interested in the future than the past. So I was disappointed when the majority of this game revolved around a fantasy setting. This was explained narratively in a way keeping true to its sci-fi background, and perhaps even by the constraints of the hardware or by the studio’s rookie nature. Granted, this was all wrapped around the context of a sci-fi storyline and it did have its moments. The main protagonists hail from an undeveloped planet – one that the Federation (exactly what you’d think) has intentionally avoided until the inhabitants have reached their space age. So when the group is exposed to the Federation initially, there’s a lot of interesting story building that takes place. And again at the end, when the answers to the questions that have been posed throughout the game are being revealed; the sci-fi elements really sealed the deal. Plus, there’s time travel and that’s super sci-fi. Most everything else is standard fare for the genre. I took the group from town to dungeon to town in search of this or that or whatever would progress the story. 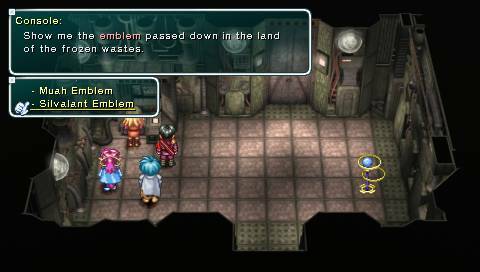 The combat system is an evolution of the real-time one pioneered in Tales of Phantasia. Instead of taking place on a 2D plane however, I controlled one of the party member’s in a 3D arena. There wasn’t a lot to fights other than mashing the attack button and maybe triggering a special attack every now and then. I was content to button mash and the lack of difficulty allowed me to breeze through the game. An air of replayability was present as not all party members could be accessed in one playthrough. I feel it was necessary for me to play this game, although I wouldn’t recommend it to others if they didn’t share my tendencies. It wasn’t a bad game, it just wasn’t that interesting. The settings offered an interesting clash, but this was mostly a fantasy game wrapped around the veneer of a sci-fi game. I found little to dislike about the combat system and could enjoy the monotonous task of mashing a button until a foe was dead, but I can’t praise it either. At roughly fifteen hours it’s the shortest JRPG I’ve played, but lengthy enough to tell a cohesive tale. Here’s hoping for a bright future.